It's quite strange to be alone, with near silence, in the middle of the day. For the past four weeks, nearly every daylight hour has been spent with students (authors of the previous blog posts), volunteers, and colleagues. But goodbyes have been said, the last student has left for home, and the kitchen at Land Hall is dark. I'll elaborate on my thoughts about the group later in this post, but I'd like first to review the archaeology that was accomplished during this field school at Fort Tombecbe. At first, one month seems like ample time to get a lot done. But when broken down into just twenty-one days of digging, leaving room for rainy days and learning curves, it becomes clear that not every research goal will be met and that creative time management is essential. As outlined in the May 18 blog post, our goals were to recover more evidence about the French buildings themselves and what it was like to live there. Our excavations of the palisade trench confirm that the initial 1730's palisade was made of cedar posts set about two and a half feet deep into a trench cut into the chalk bedrock. Pieces of cedar posts, just as reddish brown as the day the trees were cut down, were found near the bottom of the trench. An interesting adaptation to the chalk bedrock was seen in the numerous rust stains on the bottoms and sides of the trench. It appears that posts were nailed directly into the chalk bedrock to help hold them in place. At some point, probably shortly after the English took possession of the fort in 1763, repairs were made to the palisade wall. The trench was widened toward the interior of the fort to accommodate new posts and rubble such as chalk blocks and bricks were sometimes thrown into the hole and around the posts as fill. After the English abandoned Tombecbe in 1768, whatever was not salvaged by local traders was left to rot. Eventually, there was little left of that thin cedar line that protected "civilization" from its enemies. The palisade would have become a long, linear depression, into which the surrounding soil would accumulate with every rain. Fortunately for us, that soil was full of the debris left by thirty-two years of French and English occupation. In addition to post fragments and rubble, the trench fill yielded clay pipe stems, bits of ceramics, nails, green wine bottle glass, tiny beads, and other items. A cross-section of the trench for the palisade wall. Orange spots on the floor and near the sides are stains from nails that held cedar posts in place. Excavations at the bakery proved to be a bit of a puzzle this year. In 2012, we uncovered a portion of a wall that was made of square chalk blocks. The wall is located approximately where historic maps indicate the front wall of the bakery would have been. This year, we widened our view of the wall by another three feet. The wall itself is just cool to look at, as a substantial, intact architectural feature. Taken individually, each block of chalk may seem rather mundane, but looking closely, one can see chisel and saw marks on its sides. I love to point this out to visitors, most of whom find the marks as interesting as any artifact. I suppose it's not difficult to imagine a couple of guys with long saw, alternately pulling and pushing the teeth of the blade back and forth against a large chalk boulder. Each mark on a block represents specific actions of men from the eighteenth-century. But who were the men working so hard to make blocks for a bakery? Were they French? English? In the unit opened this year, the ground underneath and around the chalk wall was not the usual grayish white of the chalk subsoil. Instead, it was bright orange and brittle. Our trowels clanged when they hit it like they were knocking on metal. This is a tell-tale sign that the ground had been subjected repeatedly to heat. The orange chalk seems to have been contained within short berms of chalk, and in places, it was covered by a thin layer of ash and charcoal. We discovered a hearth! The fact that there is hearth -underneath- the front wall of the bakery demonstrates that the bakery had been rebuilt at least once. The first bakery and its hearth were destroyed and a new one built, though clearly not on the same alignment of the first. I suspect that the hearth served the original French bakery, and the chalk wall represents English efforts to rebuild it, though with considerably more substantial walls. A fascinating glimpse of everyday life was found in the bakery excavations. Within the ash associated with the hearth were numerous pieces of scrap lead and misshapen lead shot. As noted in the blog post from June 11, we think that soldiers, or someone with access to the bakery, was either making lead shot there or recycling wasters by melting them down for reuse. We were very excited to open excavations in the area where the French and English barracks would have been. The building, intended for enlisted men, was about twenty by eighty feet long but most of its remains were covered over when the Spanish constructed Fort Confederation here in 1794. Previous excavations (Parker 1982) indicated that the Spanish earthworks, at least in part, were made by scraping up the remains of Fort Tombecbe into heaps and covering all with a layer of chalk rubble. We excavated a long trench, just one meter wide, that ran from the base of Confederation's earthworks and cut across where the original barracks was located. It was confirmed, as seen in the June 12 post, that a cap of chalk boulders made up the upper layer of the earthworks. 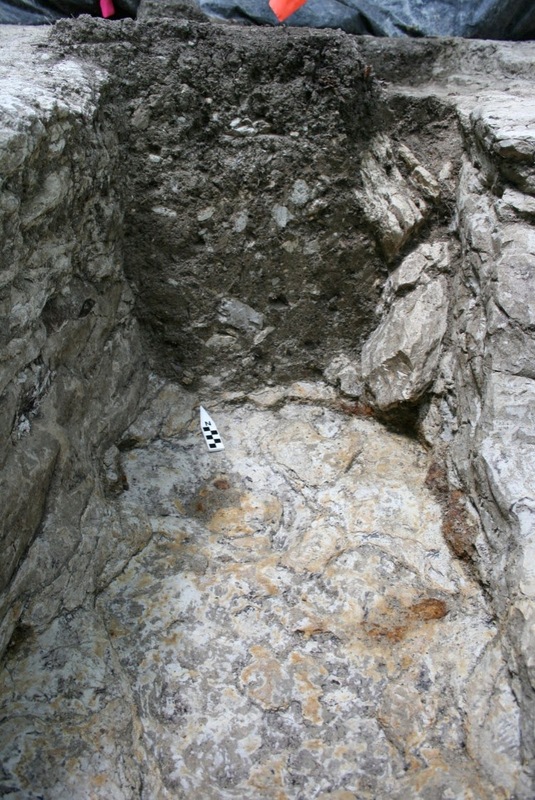 Underneath, there is a confused jumble of chalk rubble, burned soil, and artifacts. Even within just the one meter "keyhole" that we had excavated, we could see individual loads of fill that had been dumped onto the earthworks, one bucket-full at a time. In the unit excavated further from the earthworks, we encountered a layer of soil that was absolutely full of nails. 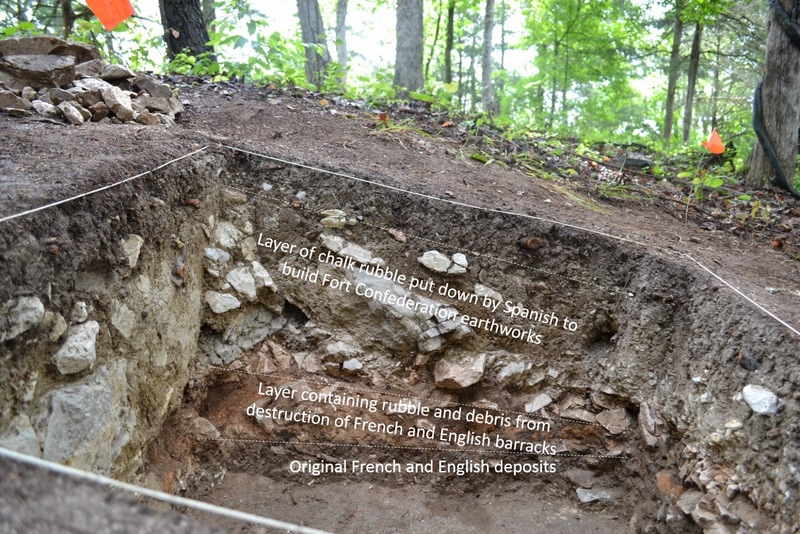 As they were found within the soil laying on their sides, rather than vertically or at any other angle, we determined that this portion of Fort Tombecbe's remains had been located underneath the barracks and may not have been disturbed by the construction of Fort Confederation. The nails may represent a burned roof. Directly under the layer of nails was a layer of dirt full of bones, including deer and cow, the remains of many meals that accumulated under the building. Further from the barracks, we opened a unit that held few artifacts, but did expose a portion of a small trench. 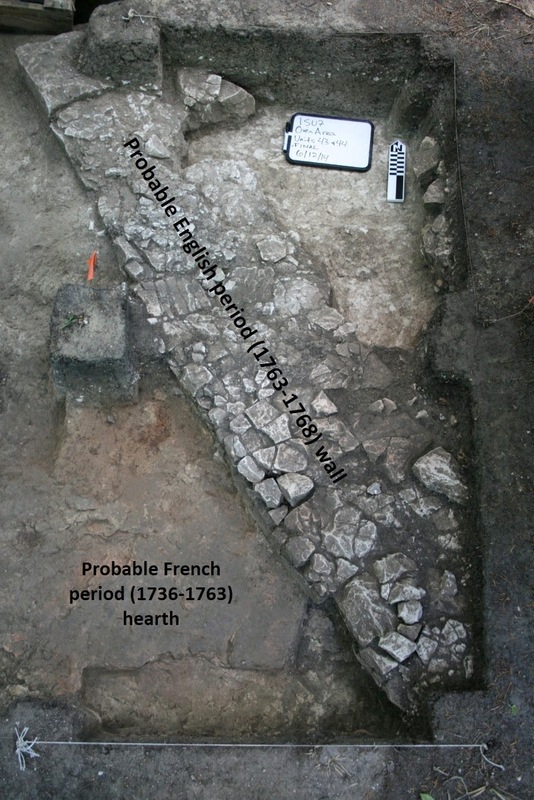 Too close to the edge of a ravine to be a building, we suspect that this trench may have been for a small palisade wall erected there by the English. We have completed investigations of some parts of the site and opened new questions in others. I want to make it clear, however, that we do not plan to excavate large portions of Fort Tombecbe. Archaeology is, after all, a destructive process. As the students and volunteers, and hopefully our readers, have learned, it is a very careful, systematic, and well-documented destruction, because once these portions of soil are excavated, they cannot be put back or reassembled. Preserving the context of artifacts by keeping notes, measurements, photographs, and other records is critical to their value for informing us about the past. At this point, we have enough artifacts and records to assemble a a story about the construction and history of Fort Tombecbe that is not found in any library or archives. As with most archaeological projects, many of the big discoveries are yet to be made in the laboratory. We have many months of washing, labeling, and analysis. None of this would be possible without the aid of students, volunteers, and a committed staff from UWA. Students can always be found, sure, but we are fortunate to have assembled another group who have plenty of cheerfulness, energy (even when the heat and humidity read 90), and curiosity. The challenges of dirt, bugs, heat, pinched nerves, dorm life, and paperwork were met with humor and creativity, if not full acceptance. If you have been reading this blog, you have probably already picked up on the strong camaraderie that kept this bunch going. Many thanks to Eleanor, Jean, Natalie, Lee, Tori, and B.J. And a big thanks to Boone, who didn't have to blog since he was a volunteer, but was no less a part of the group and had even the Texas Aggie saying "Roll Tide!" by the end of the project. The intrepid Ron "Rattlesnake" Stafford was his usual pleasant, helpful self, and I feel fortunate that he found his way to our dig. Tina Jones, the Dean of the Division of Educational Outreach, and Rob Riser of the History Department, have been among our biggest supporters, providing budget assistance, brisket, and the best pickled pears in the Black Belt. Black Belt Museum staff--Brian Mast, Emily Boersma, James Lamb, Monica Moore, John Hall, and Rosa Hall--were fully committed to this undertaking and deserve a lot of credit for its existence. A huge shout-out to Rosa for waking up before anyone else to get the coffee going and for often staying later than anyone else to see that the last fork was clean. She provided good food, expert first aid, and love. The Halls, Monica, and Tina ferried my children to daycare and helped make them comfortable with this crazy schedule, for which I am deeply grateful. To the residents of Sumter County, like Kay Stephens and Butch Watkins, whose welcoming hospitality and support make working here such a pleasure, thank you. And, finally, to our readers: we'd love to hear what you think about the project and the blog through your comments here. Thanks for reading! Awesome job. I hope to be a part of the 2015 dig if at all possible. Great article.